I had seafood for nearly every evening meal during my two weeks in Vietnam. It’s plentiful and varied. The delightfully fragrant herbs go beautifully with the delicate fish flavours. I love preparing and serving whole fish but it’s often messy once the first side is devoured. The Vietnamese have the answer. Serve the fish ‘standing up’ so you can access it from both sides, and not a skerrick goes to waste. 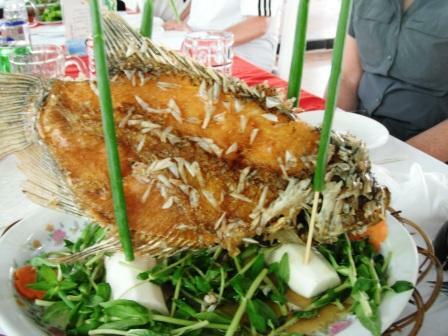 This is elephant ear fish which we ate at Ngoc Gia Trang Restaruant in Ny Tho City.